Researchers at The Open University (OU) and The University of Manchester have found conclusive proof that Ancient Egyptians used meteorites to make symbolic accessories. The evidence comes from strings of iron beads which were excavated in 1911 at the Gerzeh cemetery, a burial site approximately 70km south of Cairo. Dating from 3350 to 3600BC, thousands of years before Egypt's Iron Age, the bead analysed was originally assumed to be from a meteorite owing to its composition of nickel-rich iron. But this hypothesis was challenged in the 1980s when academics proposed that much of the early worldwide examples of iron use originally thought to be of meteorite-origin were actually early smelting attempts. 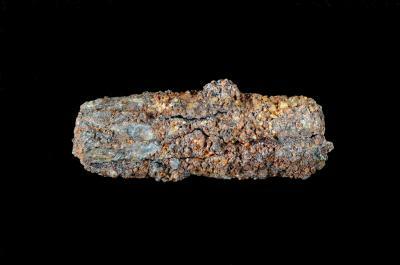 Subsequently, the Gerzeh bead, still the earliest discovered use of iron by the Egyptians, was loaned by the Manchester Museum to the OU and the University of Manchester's School of Materials for further testing. Researchers used a combination of the OU's electron microscope and Manchester's X-Ray CT scanner to demonstrate that the nickel-rich chemical composition of the bead confirms its meteorite origins. OU Project Officer Diane Johnson, who led the study, said: "This research highlights the application of modern technology to ancient materials not only to understand meteorites better but also to help us understand what ancient cultures considered these materials to be and the importance they placed upon them." Meteorite iron had profound implications for the Ancient Egyptians, both in their perception of the iron in the context of its celestial origin and in early metallurgy attempts. Co-author Dr Joyce Tyldesley, a Senior Lecturer in Egyptology at The University of Manchester, said: "Today, we see iron first and foremost as a practical, rather dull metal. To the ancient Egyptians, however, it was a rare and beautiful material which, as it fell from the sky, surely had some magical/religious properties. They therefore used this remarkable metal to create small objects of beauty and religious significance which were so important to them that they chose to include them in their graves." Philip Withers, Professor of Materials Science at The University of Manchester, added: "Meteorites have a unique microstructural and chemical fingerprint because they cooled incredibly slowly as they travelled through space. It was really interesting to find that fingerprint turn up in Egyptian artefacts." The paper, 'Analysis of a prehistoric Egyptian iron bead with implications for the use and perception of meteorite iron in ancient Egypt,' is published in the Meteoritics and Planetary Science journal.